Henges are prehistoric British constructions, generally consisting of a round flattened area surrounded by a boundary earthwork, usually consisting of a bank and/or a ditch. Although they are concentrated in Britain, it is suggested (2), that they are a local variations on other causewayed-enclosures and defensive ramparts found at other sites in Europe (such as the Rondel enclosures' of Bavaria's Isar Valley). In response to this, it is noted that the arrangement of banks and ditches at British Henges is such that they offer little, if no protection, and there is a clear association with Grooved ware products, something which has not been found on the continental mainland. What was the function of Henges? When were the first Henges made? 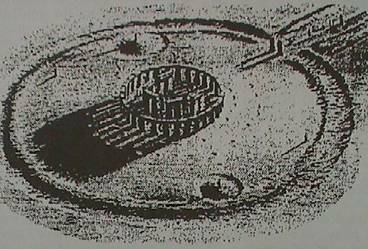 List and Description of UK Henges. 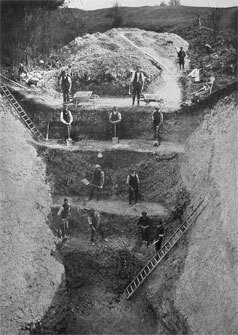 The banks and ditches around Henges were often built on a massive scale. The ditch at Avebury, for example, is 9m deep and over 20m wide in places, while that at Durrington Walls is 6m deep and 16m wide, with a 3m high bank. The earth used to build the banks was taken from the ditches and the central area flattened (Except for the Ring O' Bookan on the Orkneys, which is suggested to have once contained a mound similar to the nearby Maes Howe). Coves are a group of three to five stones that form an squared enclosure within stone circles and Henge. An opening between the stones, oriented south east is also a feature. 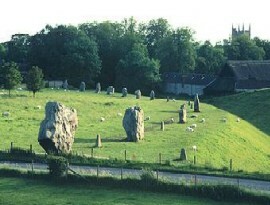 The Avebury cove (Photo: Right), is recorded to have once had a third stone which completed the cove and faced the existing slender "male" stone. This fell in 1713 and was destroyed, just before Stuckley's drawing in 1720. Other examples include the following: Stanton Drew, Mount Pleasant, Callanish, Arbor Low and Stennes below. 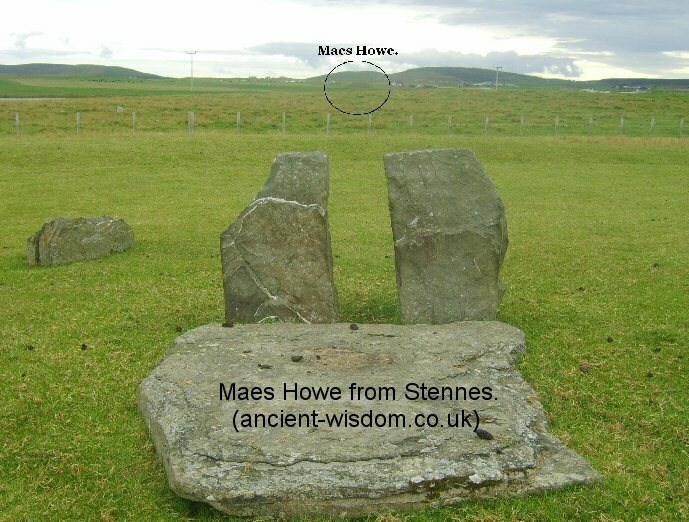 The Cove in the Stennes stone circle, Orkneys is controversially orientated towards Maes Howe. 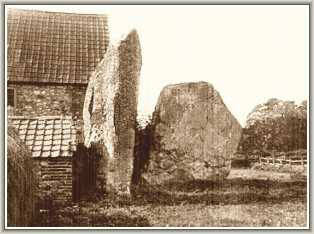 The Henge at Avebury was originally 17m (55ft) high from ditch bottom to bank top with a perimeter of over 1km. What was the Function of a Henge? One of the most noticeable design features of Henges is that the banks and ditches are not complimentary in terms of defensive structures (as the ditch is generally on the inside). This has led several people to suggest that they served 'Ritual' purposes, although this by no means pinpoints their exact nature. The outlying portal stones/posts found at such sites as Priddy, Mayburgh, Maumberry, Milfield N, Yeavering, Woodhenge and Stonehenge are all evidence of specific orientation of the Henges. At Stonehenge we know that the four original sarsens (of which only the 'heel-stone' remains), were originally placed to mark events on the lunar cycle. Astronomy: It has long been suspected that Henges may have been constructed in order to create an artificial horizon line. The idea is compelling but there are objections to the theory as an absolute. At Arbor low for example, the Henge is built on a slope, and the height of the Henge is constant, following the slope of the hill, giving it no practical astronomical potential. At Avebury, even the largest Henge in the world cant hide the surrounding hills, and folds in the countryside, which likewise make the building of a Henge for astronomical purposes unlikely, to say the least. There is a tendency for Henges with a single entrance to have that entrance set in the north or north-east while sites with two entrances are aligned SE-SSE to NW-NNW or ENE-E to WSW-W. It is now recognised that the Henge at Stonehenge and the three at Thornborough were built at locations which had Cursus at them before the Henges were built. This fact suggests that the Henge design was 'successors' to Cursus in some respect. The most immediately noticeable difference between the two structures is that one is round while the other is elongated. Apart from that, the two share several similarities, not least their being superimposed over each other, (suggesting that the location itself was likely of importance), as well as this, both monuments share a flattened central area surrounded by a bank and/or ditch. The Stonehenge Cursus has recently dated at 3,500 BC by a team from Manchester University and is therefore older than the Henge. (7) It is orientated towards the structure known as Woodhenge. When were the first Henges Constructed? The earliest Henges were built as early as 3,200 BC (Llandegai North) (1), but the majority were made between 2,700 and 2,000 BC. Avebury, England. - The largest Henge in the World. Banks and ditch originally measuring over 15m from bottom to top (right). Part of a larger connected, ritual landscape. Has two avenues leading from it; the Beckhampton and West-Kennet. Dorchester Big Rings, England - This Henge has the same circumference as Stonehenge (366 MY) (4), It lies on the St. Michael's Leyline, and was built over a Cursus monument, as were Thornborough and Stonehenge. Knowlton Henge - The last remaining of an original three Henges, the Knowlton complex is now realised to have been re-used as a part of the sacred Dorset landscape for thousands of years, ending with the Norman conversion in the 12th century when a church was built in the central Henge. Priddy Henges - Another Triple Henge complex. Stonehenge - The Henge was the first structure built at c. 3,200 BC. The nearby Cursus has been recently dated at c. 3,500 BC. It is said that during the first phase of activity 'The sun apparently didn't interest the builders'. (1) The Henge has a circumference of 366 MY (4), and the site is located on the exact latitude such that the Sun and the Moon pass overhead at 90° relative to each other on their maximum settings. Thornborough- The Thornborough complex consists of three vast Henges aligned to Orion, and connected together by a 'ceremonial' path. The Henges were built over an earlier Cursus. The circumferences of the Henges is 722 MY (2 x 366). Waulud's Bank - This partially destroyed Henge feature lies on the St. Michael's Leyline, near the Icknield Way, and encloses five springs which make up the source of the River Lea. Goseck, Germany - Recently restored Henge on the same latitude as Stonehenge. Dated at 5,000 BC. Castelruddery, Ireland. - This small Irish circle has two 15-ton recumbent, quartz, portal stones. Lismullen Henge, Ireland - Recently destroyed along with 41 other archaeological sites in the Tara Skreen Valley, Ireland by the development of a double tolled motorway through Irelands most sacred landscape? Bryn-Celli-Ddu, Wales. - Wales. The original Henge structure was later converted into a passage mound. Bryn-Gwyn, Wales. - Welsh Henge. Trelleborg - A Danish Henge on the island of Zealand, sited at the confluence of two rivers. This Henge has produced several Neolithic 'ritual objects' such as polished axe heads, including one of Bluestone (The same stone used at Stonehenge) (2). 1). Burl, Aubrey. The Stone Circles of the British Isles. 1976. New Haven: Yale University Press. 2). Cope, Julian. The Megalithic European. 2004. Harper Collins.